Echo Meter Touch 2, plug-in modules for iPhone, iPad, or iPod Touch allow the user to listen to, record, and automatically identify bats by their ultrasonic echolocation calls. 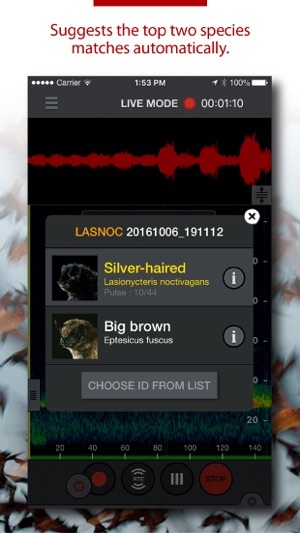 The modules and this companion iOS app reveal the silent and often times invisible world of bats, providing outdoor enthusiasts, citizen scientists, and researchers an affordable and informative way to interact with these important creatures. There are two models available, either directly from www.wildlifeacoustics.com, or through distributors worldwide. Echo Meter Touch 2 (EMT2) costs $179 and is intended for nature enthusiasts and batting hobbyists. The Pro version (EMT2 Pro) costs $349 and is designed for bat professionals and features a higher quality microphone, adjustable gain, higher sample rate, as well as advanced settings. The Echo Meter Touch Ultrasonic Modules sense ultrasonic signals, digitize the signal, and transmit the ultrasonic data to your the app on your iOS device. The EMT2 offers exclusive features and unprecedented ease-of-use for a handheld bat detector. EMT2 translates bat echolocations into frequencies that are audible to humans using two technologies. Wildlife Acoustics’ patented Real Time Expansion (RTE) allows you to listen to bats in real time with unparalleled fidelity. RTE maintains the timing and tonality of the original echolocations. Heterodyne (HET) listening via manual and automatic tuning is also available, for those accustomed to that way of hearing bats. A real-time spectrogram shows the frequencies and timing of the echolocations. Scroll back in time and zoom in on previous "bat passes." 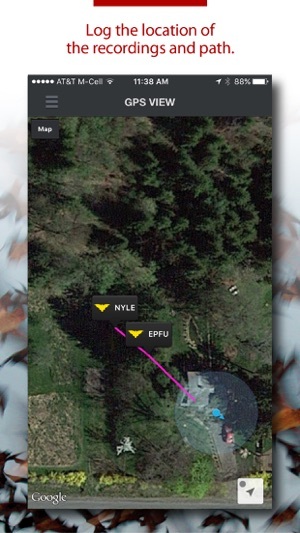 The Auto ID feature analyzes the echolocation calls and suggests the two most likely bat species matches in real time. This is the same technology used in our professional Kaleidoscope Pro Bat Auto Identification software. 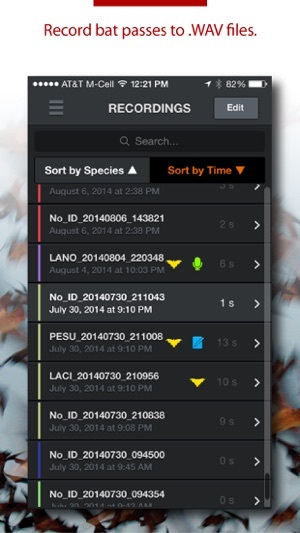 Currently, the app can identify 26 species in North America, 25 in Europe and 57 in the neotropics. For more information on Kaleidoscope and a full list of species, visit our website. Activate triggered recording mode to automatically save bat passes to full spectrum .wav files for analysis on a computer or to view on your iDevice. Or use manual record mode to control start and stop of recording. 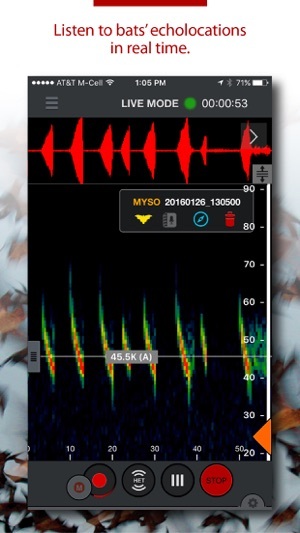 View the recording spectrogram and add voice or text notes. Listen to the recording using RTE, HET, or traditional Time Expansion Playback (playback at fractional speed to make the ultrasound audible). View in satellite or road map view. View identified species codes directly on the map. Go to the recording's spectrogram from the map view. Transfer to your computer to view in Google Earth. Your iDevice must have GPS capability or you must use a Bluetooth GPS receiver for this functionality. The EMT2 can transfer the .wav recordings to your computer over a Wi-Fi network or cabled through iTunes. Using Wi-Fi, the app bundles the recordings in a .zip folder and allows download by entering a URL in any web browser. And import and open files that have been shared with you. ***Because bats vary their echolocation calls in response to a wide variety of needs, no automated identification can achieve 100% accuracy in species identification. Auto-ID, though largely accurate, should not be relied on as a basis for scientific research. Auto-ID is intended for use in analyzing recordings of single bats in free flight in low clutter environments. Auto-ID will not work well on recordings of roost emergence, multiple or captive bats, bats in high clutter environments, or bat social calls. Auto-ID does not include every possible bat for each of the covered regions. +Fixes an issue where deleted recordings could still be shown in the exported KML file. © 2014-2018 Wildlife Acoustics, Inc. All Rights Reserved. Patents Pending.